Aloo Bhujia paratha is yummy and has a delicious taste. This paratha is stuffed with potato,bhujia, onion, ginger chili paste and with some spice. aloo bhujia paratha can be served any main meal-making it special treat on the weekend. This paratha can serve with butter, yogurt, chutney, and pickle. Take a big bowl to add wheat flour, salt oil mix and add water as per required to make a soft dough. Then the dough is ready to cover it with a damp cloth and put aside for25-30 minutes. For making stuffing take another bowl to add grated potato,bhujia, onion, ginger, green chili, fresh coriander black salt lal mirch powder, dry cumin -coriander powder and mix it well. After 30 minutes dough is ready, divide 8 equal portions of dough and stuffing also and roll into balls. Take a portion of the dough make a round ball and give shape like peda, coat in dry flour roll it with the help of the board and roller pin 3-4 inch in diameter.Place2-3 tsp stuffing over the rolled out paratha, close the stuffing by lifting from all side. Press with palm to spread stuffing evenly. Then coat it with dry flour again, roll it out from the edges keep little thick. Put the paratha to roast on the tawa. Keep the flame medium, then both sides come lightly brown spots come, flip it and apply oil on both sides and roast well. 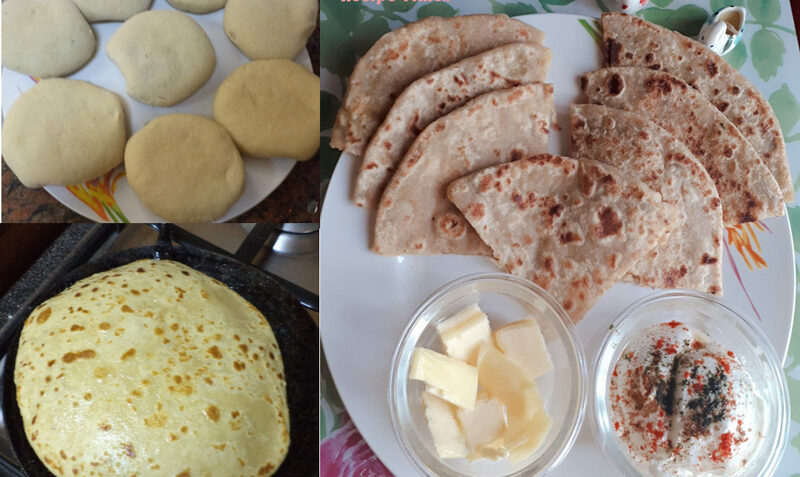 Paratha is ready to be served, other parathas are made the same way. Serve this Aloo Bhujia paratha with butter, curd, chutney, achar and pesto anytime breakfast, lunch and relish time.